There’s been an increase in detections of drink driving, people not wearing their seatbelts and people using their phones. 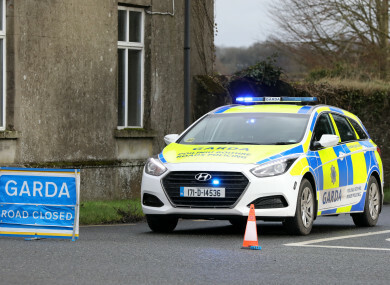 AN GARDA SÍOCHÁNA has issued an appeal to the public to be safe on the roads after initial figures for the year indicate that there’s been a 30% increase in the number of road deaths. Of the 34 people who have lost their lives in fatal road traffic collisions so far this year, 25 have either been a driver or passenger. There’s also been an increase in detections of intoxicated drivers, people not wearing their seatbelts and people using their mobile phones. Chief Superintendent Paul Cleary, Garda National Roads Policing Bureau, said today’s figures “affect all parts of the country”. Analysis from 2018 reveals that nearly 1 in 3 of vehicular fatalities had no safety belt on at the time of the collision. Early investigations indicate this trend is continuing into 2019. Other factors such as speeding (or inappropriate speed due to weather or road conditions) and intoxicated driving are also significant factors in fatal road collisions, the Gardaí said. An Garda Síochána said that “non-compliance creates risk on the road to all road users”. Mistakes on the road cause collisions, preventing mistakes prevents collisions. Please note this significant increase in road deaths and Think and be safe every journey. Email “Road deaths have increased by 30% so far this year”. Feedback on “Road deaths have increased by 30% so far this year”.